Home > Battery Storage > Are micro inverters & battery backup compatible? Are micro inverters & battery backup compatible? 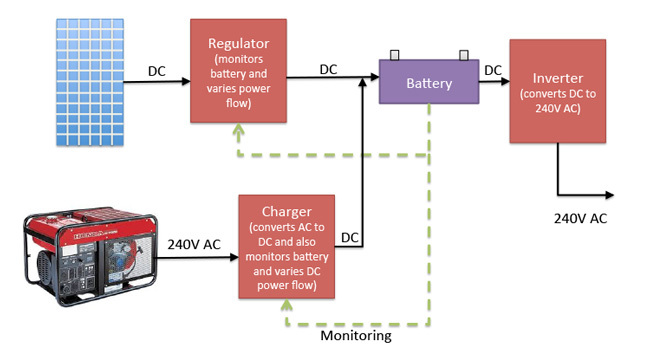 Can you combine micro inverters with batteries? Yes you can! 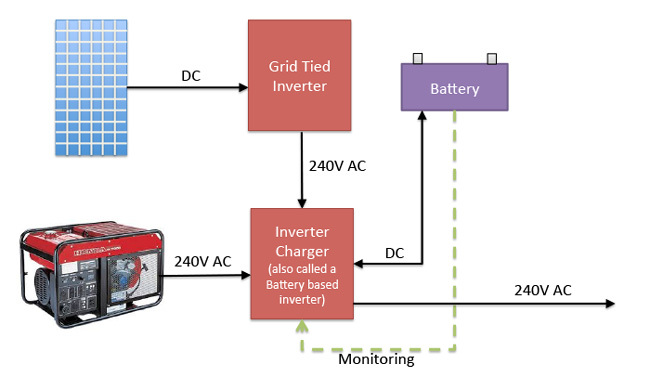 Can you use a micro inverter off grid? Or even for grid connect with batteries? With the growth in the use of micro inverters, I’m starting to get more and more emails asking: can micro inverters be used in off grid (or hybrid) solar power systems? The short answer is yes they can! In fact a number of micro inverter battery backup systems are already operating here and abroad. The longer answer gets a bit technical – but I’ll try to keep it as simple as I can! Let’s get back to absolute basics for a minute and focus on off grid systems: The fundamental difference between Off Grid and Grid Connected solar power systems is that Off Grid systems need to store the energy in batteries. The energy produced by your solar panels (or wind turbine, hydro or generator) needs to captured and stored so it’s available when you need it. The simplest battery storage system. A panel a regulator and a battery Everything is DC. If you only ever use DC power, this can work very well. In fact this is the system I use when I go camping to keep my Coopers Pale Ale cold in my DC fridge. Trust me – it works! To charge batteries with AC you use a Charger. In both cases when the batteries are full the regulator or charger will switch the energy input off. Once it is stored in your batteries you can use the energy as Direct Current (DC) if you have DC appliances, but in most cases an inverter converts the DC power to 240V AC, just like mains power. Putting everything together for a proper off grid system. So, we have our energy stored, a regulator and charger and an inverter to power the loads. Years ago, inverter manufacturers realised that combining these into a single unit made sense and invented the inverter/charger (also known as an off grid inverter). These were typically designed to accept a variety of inputs and outputs AC input from generators or mains power, DC input from batteries and so on. Typically, solar panels and other devices continued to be connected via a regulator to the batteries. Modern off grid systems use a single inverter/charger (AKA off grid inverter). 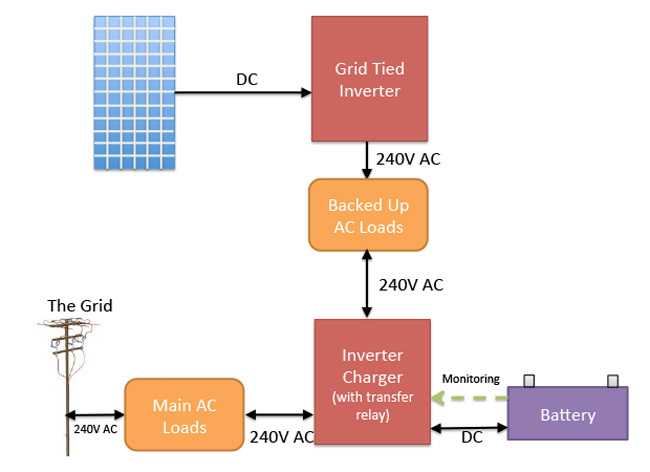 An AC coupled system using a grid tie inverter and an inverter/charger (also known as a battery based inverter). By coupling everything except the battery on an AC Bus, management, monitoring and efficiency was optimised. Although it cost a little more in electronics, transmission losses were minimised, cable sizes were reduced and flexibility improved. One of the major benefits is that if the AC generation source matches the load size, it effectively powers it directly, bypassing the batteries. Another is that if more power is needed, the AC generation source and the inverter charger (drawing power off the batteries) can parallel together, increasing short term capacity. AC coupling can be done at a household level or in much larger micro grids and they can operate with or without a mains connection. A grid tied with battery back up AC coupled system. So, now, we have our energy stored, but energy sources and outputs are all 240V on the input and load sides. The sophistication of the control and regulation systems required to make this all work smoothly cannot be underestimated; there can be a hell of a lot going at any point in time especially if you have multiple energy sources which can vary their output, and loads which obviously vary a lot too as we go about our daily life. Luckily, the world has some very clever people and a number of inverter manufacturers highlight their ability to handle AC coupling from solar panels including Selectronics, SMA, Schneider, Outback Power, Magnum and Midnite Solar to name a few. Although I don’t want to underestimate the sophistication required to make a great inverter/charger there are two major tricks in getting AC Coupling to work successfully. From a safety perspective, Grid Connect inverters are always searching for a 240V AC reference source and are designed to shut down if it isn’t present simulating a line worker switching off the mains for maintenance, for example. So, in a non-mains connected AC coupled system, the Grid Connect inverters need to be tricked into believing its present by creating a reference point. The inverter charger can do this by creating 240V AC from the battery or if other sources are present (such as a generator) they can too. Either way, as you can imagine, this involves some pretty sophisticated controls to be done safely and reliably. 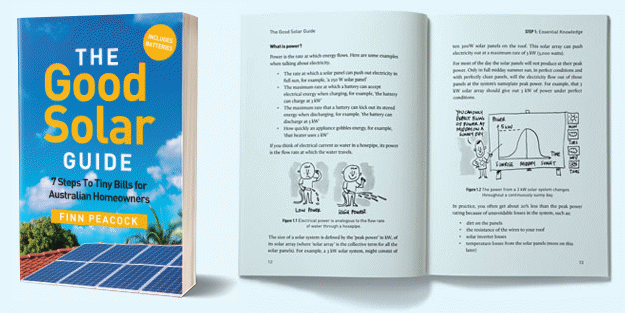 The second issue is how to regulate the AC energy source to prevent the batteries being overcharged and, to prevent the voltage and frequency from being distorted. If the grid tied inverter and the inverter charger can communicate with each other then the inverter charger can ask the grid tied inverter to gently throttle the power flow up and down as needed. If these 2 boxes don’t talk to each other then the inverter charger needs to either use a more brute force way to get the grid tie inverter to reduce the flow of power from the solar panels. Different inverter chargers and control systems use different techniques to do this; SMA uses a process of shifting the frequency. Most of the others “throttle” the power in a more traditional way but both systems reduce the energy input into the battery. Ultimately, there also comes a point where there may be no load, the batteries are full and lots of energy being generated. Some systems can cope with this by throttling, others require control relays to divert energy and in some cases this needs to be “dumped” into a load such as a hot water system or water pump. A crucial point here is that you can’t just cobble a system like this together. The systems all need to communicate very rapidly, highly reliably and the obviously need to be matched in terms of their ability to handle the power flows. It’s not simple but it absolutely does work and has been gaining favour as a solution for many years. So, logically micro inverters that present solar as an AC source can indeed be coupled into these types of systems. In the last 2 block diagrams above you simply swap out the solar panel and grid tie inverter for all your AC solar panels. And a quick call to a couple of suppliers revealed that there are already a number of such systems operating in Australia. By coincidence, I also spoke to a local chap the other day who regularly conducts training in off- grid systems and lives off grid in Victoria. While I was on the phone, he literally plugged a micro inverter equipped solar panel into his off grid system and it simply connected and started generating; doing exactly what it was supposed to. As is the case with non-micro inverter based systems, everything needs to be matched and configured properly but as one example, Enphase have a specific white paper on the issue. Interestingly, Enphase highlight that one advantage of using micro inverters instead of string inverters is it allows each panel to be individually “throttled” (assuming a compatible inverter-charger), maximising flexibility and efficiency. 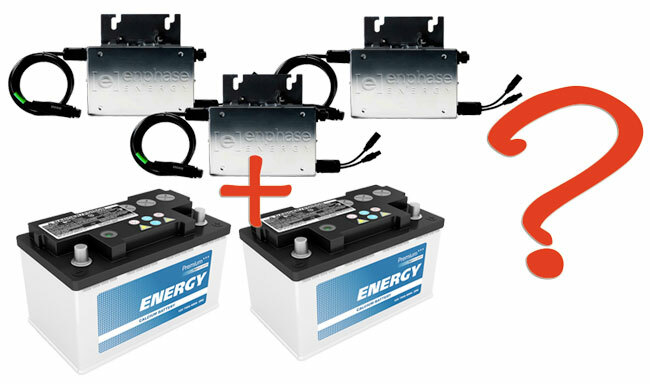 Recently however, Enphase announced a new generation of smarter micro inverters, which will effectively allow them to make many of the traditional components of an AC coupled system redundant by embedding more of the control and power conversion functions of the inverter/charger into the micro inverter itself. So if you buy a microinverter based system you won’t be left high and dry if you want to add batteries in the future, you’ll simply need an AC coupled system. In fact the way technology is progressing it would not surprise me if batteries will soon come with “micro inverter/chargers”. So you may be able to have AC solar panels plugged directly into AC batteries. You read it here first folks! (And I must confess that I actually read it here first last week). Previous Article: Is coal now more expensive than solar? Thanks for this article Finn.Two months ago I installed an Enphase micro inverter system.On your recommendation.Yesterday It generated 22kwh.I am quite happy.Interesting that my system has future potential to store some of the power the solar panels generated. Remember the teaspoon-sized metal link the failure of which destroyed more F-111’s than enemy activity ever did?….and before that the super-sophisticated F-104 Starfighter? Some time ago I asked whether some whiz-kid could find a way to circumvent/eliminate the “240V AC reference source” in ‘ordinary’ string inverters, so’s they could be used in a stand-alone situation, and got no response. Any ideas? ~ That’d still be my favourite option; easy to install and protect from the weather, convenient to inspect/maintain and cheap to replace if necessary. I’m too old to be dancing around on the roof in a storm, torch in hand, because the bloody lights have gone out. The main problem with a KISS-based system seems to be they leave little scope for drawing boxes….with cute little arrows sticking out of them. ps. Just for interest’s sake:- How does one connect multiple AC sources? Simple series/parallel setup as in DC? Isn’t frequency-matching essential? ps…Are you sure you’re an engineer? You strike me as being far too chirpy and enthusiastic to be one of those. Thanks for the article Finn. The Enphase storage idea is you link to near the end of the article is particularly interesting. How do you suppose the connectivity to the panels would work, given the microinverter is at the battery not at the panel. Obviously it would be a lot of wiring if each panel were connected to a storage module, so do they run say a 24VDC buss to the modules? I assume that they all hook up to the 240V house circuit like any other appliance, and use power line comms (or even wireless) to determine which batteries charge/discharge at any point in time. I don’t think you need to directly connect each micro inverter to a corresponding AC battery individually. I’m EXTREMELY interested in this stuff however I’ve been advised on numerous occasions by supposedly knowledgeable folk that using grid inverters off-grid is completely impossible. Seems to me it should be a relatively simple task to ‘fool’ a grid inverter into believing its actually` on grid when it isn’t.. Will certainly read up on Enphase shortly and would greatly appreciate any comments others can provide rev this issue. I’ve been trying to achieve that for a couple of years ~ and have asked here several times. (it should be a relatively simple task to ‘fool’ a grid inverter into believing its actually` on grid when it isn’t.. ). With no real response from anyone who might know. Hi Guys – sorry for the delayed response. Please see the second to last block diagram. It is absolutely possible to use a grid tied inverter in an off grid system – you need to use a battery based inverter (AKA inverter charger) which produces a sine wave good enough to fool the GC inverter that it is the grid. Selectronic, outback power, midnite power can all supply battery based inverters to do this among many others. Good news, if a long time coming. If what you say is accurate, and it’s a not-overly-difficult job, is it possible for you to perhaps list a few sparkies/engineers in each state that would do the job for an appropriate fee? I’ve asked a few and found no interest in ‘doing things differently’. I’m currently using several ‘MeanWell’ inverters for various things, and they do a good, no-problems- job (sound 3-year warranty as well) and wonder whether one of them (200w -700 watts) would do the job. I would also have thought it could have been done such: use a change/over switch. switched one way it draws power from the grid to a battery charger 240vac to say 24vdc which in turn power a 24vcd to a 240vac pure sine wave inverter (no batteries). dump the excess power into a water storage using one of the gadgets you mentioned in a blog. No grid application, no export for a pittance to the grid, design your system so that you purchase the minimum from the grid and sell nothing to the grid. A large battery bank for 5kw system costs about $7,000 and might last diminishing 7 years, and that will add $250 to your quarter bill plus the lack of interest on your money. I would like a comment. I am about to install a 5kw system using Enphase inverters, but cannot get a detailed quote from any installer, i.e. cost of: racking, panels, inverters, cabling, monitoring, installation, deducting my STC credit separately. All the electricians here want $3,000 for two hours work. I will do it myself and sacrifice the STC credit rather than give it to some rip off merchant. Frequency limits: over frequency 54 Hz, under frequency 46 Hz. Trip time, voltage or Hz = 1 second, reconnect = 60 seconds. I now have my 5 kw system sitting nicely on my roof, and no Utility grid approval yet, and maybe never. Not to worry. My plan is different from my last blog. I will use: 30 Amp isolator, change over switch, Morningstar relay driver to measure the battery voltage, it will drive 2 relays (the 5 pin auto type) which again will control two solid state relays, one for the grid and one for off grid. If you take a couple of take offs from the panels via Y connectors then you have both 230 Vac nominal plus 24 – 32 Vcd. Connect this DC to the hybrid inverter which again will charge the batteries. The battery voltage will determine whether you are on the Utility grid or you are stand alone. The system will wake up in the morning automatically and shut down sometime in the evening depending on your battery bank size. Don’t buy to many of these as so much new development is happening in the battery world including prices. The utility Grid people are doing all they can to stop us using solar, but they will loose out in the end. I can see the day coming when I will tell them to come an pick up their meters and wires and that will be two accounts lost. Question: I am about to install a 5kw system on my colobond roof that has a 30 degree pitch and is facing north. It’s it possible to be totally independent of the grid without going totally off grid? I.e can I still be connected to the grid without using the power from the grid with a battery storage say, tesla power wall? I’m thinking of the obvious service charges etc that can be forced on me for totally going off grid so if I still have the grid connected as a final back up, is this possible? Yes – it is called Hybrid Solar, and you configure it to only draw power from the grid when you really need it (instead of firing up a diesel genset if you were off grid). And the excess you feed back can usually cover most of the grid service charges. Hi Finn. Thanks for the very interesting article. I am in the Bahamas and have as you call it, a Hybrid Solar system which includes 9,240 watts solar panels feeding an SB8000 coupled to x2 SI4548 and 856 ah batteries. Yes I use the grid as backup but here we are not allowed to feed in! Bahamas should be Bananas as in Republic! I called SMA and they said that it is not possible to connect micro-inverters to my home grid as it would upset the Sunny Islands and there could be a possibility of overcharging the batteries or doing some electronic damage. Somebody can recommend some brands of hybrid inverters ? Fronius Symo Hybrid or SMA Sunny Island would be my choice at the moment. I will need 20 kWh to run my 4 split system aircon overnight. Thus I will need 17 units which will cost me $23,460. The units can DOD to 95%, and 7300 cycles or 10 years whichever comes first. I have a 6 kW enphase micro inverter system, but will not be able to consider the AC battery at this cost. I have 36 kWh lead gel batteries which runs my house 24/7 completely isolated from the utility grid. During aircon season I will have to purchase from the grid (isolated from my PV system on separate lines) as my bats and 2 x 8 kW inverters will not cope with this extra load. As I see it, it isn’t possible to go completely off grid unless you have a small household load. Without aircon I am fine, but I don’t think anyone using between 2 to 4 aircon can do so without a huge expense whether AC battery or PowerWall. One day we will have a Flow battery and this will be a game changer. At present a 2.5 kW Flow battery costs around $13,000 but I see the day when you can purchase the kit on Ebay (bar the tanks which you can make) and put it together yourself. I would like to hear from anyone who has done it. I know its sometime since you wrote this article so I hope u are still around to give a reply! I am considering the pro’s and con’s of a central or micro inverta system and have been quoted on an Enphase miscro inverta system which I am learning toward. I too would like to add AC lithium ion batteries but the cost is still prohibitive. Questions: Have you had any problems with the Enphase Micro inverta e.g heat related? Have your lead gel batteries performed to your expectation? i.e. the AC coupling issues ever been a problem? Yes Mick, I am 80 this year and still above ground. No, I have never had any problems with my Enphase Micrio inverters, they have worked fine from day one, and as you may know I am in Silkwood, N.Qld. never any heat problem,,, but my panels are at 15 degree angle supported on a structure placed on a flat concrete roof, thus a lot of ventilation,,, how they would perform sitting 100 mm from a tin roof might be another matter. No, I am not happy with my gel batteries. They will be 3 years old next January. They are still performing but I am not sure how to desuf… them… I would have chosen lead acid instead…. I don’t know what ac coupling means. My batteries supply power to the load and thus to the micros as they need to see about 230 vac to wake up,,, then the load is connected to my inverter which runs bi-directional from/to the bats. The system runs fully automatically, governed by the battery voltage which is read by a Morningstar relay driver with 4 ports, each with different thresholds and delays, thus I can turn off or on: one 2.5 kW or two 2.5 kW or just a 1 kW, I can send power to my HW tank with the 1.8 kW element depanding on the power available. Summing up: I am happy with the micros, but should have chosen lead acid instead of lead gel….I am saving about $3,200 yearly in power in this household of 6. Instead of trying to get rid of the utility grid, I shall later try to get on the grid with my system. I was denied grid access because I applied for 5 kW so I instead of installed 6 kW outside the grid. I have 3 phase connection for my 3 phase elevator motor,,, and I now believe that it is possible to have 5 kW on each phase…. I have had 3 phase power here for 27 years, and I can only assume that the grid people are all against solar power,,, but lately maybe some change of mind,,, if you can’t beat them —- join them… maybe. Thats great info John. I will go for the AC microinverter system grid connect but leave the batteries for a while. With the new generation batteries with higher efficiency, is there still an advantage to running a grid tie inverter, battery inverter and AC bus, rather than than using solar regulators and an inverter/charger? Also has there been any updates on the easiest way to wire micro inverters to the battery and the AC switchboard? Finally, if its hard to find people with the knowhow, could solutions in your other article be used, for example, using DC optimisers, solar controller/s, traditional string hybrid/inverter charger? What if there needs be multiple autonomous solar systems onsite, e.g. for different buildings/families who need to be responsible for their own power bill? In this situation we can’t simply couple everything on an AC bus on the output of a battery inverter. With a battery inverter where the PV power is fed into the battery with a solar controller, and the external AC input is controlled separately, each household can be programmed on what conditions it is allowed to interact with the other households. We don’t want one power hungry household dragging the whole system down and not able to learn from the consequences of pushing limits and eventually having their solar system scale back its power. Can micro inverters be integrated to achieve connected yet autonomously programmed households in this way? Need your advice. I have 4000 watts home inverter / battery power back up powered from the grid. In Nigeria we need it because of frequent power loss from the grid for hours. Can I now use an the power from an array of PV + MICRO INVERTERS (4000 watts) as substitute to the grid in the afternoons (my total power usage is 2700watts hr at any given time and my home back up is needed for alittle while in the night when the grid fails. YEs – with AC coupling you can get have grid backup with Microinverters. Hi Adam we have a Bi-directional Converter solution used widely throughout Asia that is specifically designed for the unreliable grid scenario you describe. Contact me if you would like to discuss this further. What is a Bi-directional Converter? I understand the Bi-dir part of the sentence. Excellent info on the website which has been very helpful. 1. 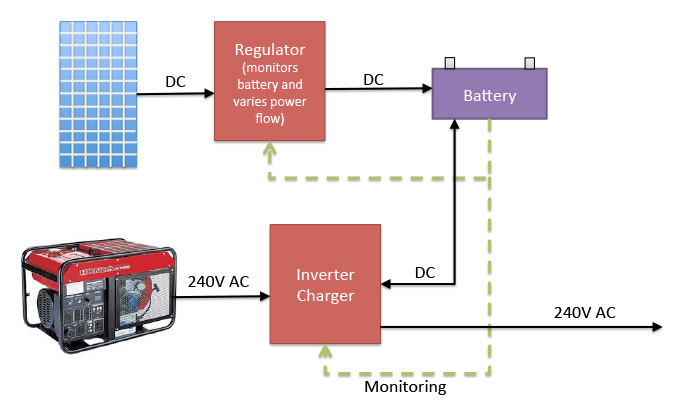 What is the difference between Hybrid Inverter(s) and Micro Inverters? 2. What does it mean to be battery ready? No more to pay or will there be some expense when we eventually add the battery to the solar system? 3. Brands of good Hybrid inverters please? I have a microinverter solar panel system (32 microinverters Enphase M-250, with 32 Recom RCM 315 panels) grid tied. But we need electric power, to turn on the solar system and in PR after hurricane Maria it is a problem. What kind of battery I need to keep my solar system on as a back-up , not to storage energy, just to used the solar energy at day light? You could also consider into installing a Powerwall 2 with backup capability, even though you mentioned you’re not interested in storage. I am very far from being an expert on PV power. Here is what I would do: As you know the micros re quire to see V/AC. So I would get a small inverter/charger 24 VDC to 120/240 VAC. Use 4 off 12 volt batteries, 2 in series and then parallell the two sets. Turn off the Grid Main Switch…. connect it bats to the inverfter,,, then on good sun, say 8 am, switch off all power hungry items in the house, turn on the inverter, and after 60 seconds you should see the power surge, then turn on all the gadgets you normally use,,, monitor the battery voltage, but some inverter/chargers have a min/max voltage limit. I use this system in my shed, 4 batteries from the rubbish dump… works well. Good luck, and don’t connect anything unless you are an electrician or know what you are doing,,, remember I said “The Main Switch OFF”. I hope you all soon recover from the hurricane. I have just had 3 quotes for between 4.5 to 6 KVA solar. Two with the in line inverter and one with the micro-inverters. The micro inverters seemed like a good idea with the major pitch being safety – does not overheat, reduces voltage, etc. Then the other supplier told me that the micro-inverters were old technology and the company Enphase was falling behind and would most likely close down in the next few years. Now more confused. Any suggestions on wether to go the one large inverter vs micro-inverters? And if this will be redundant technology in near future? We live in Hervey Bay, QLD and have pretty great sun year around. Microinverters do have a safety advantage over string inverters because there are no DC cables on the roof, but the chance of a properly installed string inverter having a dangerous fault is extremely low. So microinverters are safer, but it rarely makes a difference. Whether technology is new or not isn’t particularly important as far as I am concerned. What I think counts is reliability and Enphase microinverters are reliable. While they’re not perfect, they rarely fail and have a 10 year warranty in Australia and similar models they sell in the US have 25 year warranties. Enphase has had financial problems but my guess is they will continue to be around long term, although it is impossible to know. There are plenty of examples of companies that appeared to be doing fine going bust in just a few years. But even if they are not around, there should only be a small chance you will need to make a warranty claim within their 10 year warranty. With a 4.5 to 6 kilowatt system, a string inverter is very likely to be cheaper, but microinverters are better at tolerating the effects of shade and dirt on panel output. If your roof doesn’t have shade problems then a string inverter system is generally the most economic choice. But people who want the highest output they can get per panel and don’t mind spending extra to get it often go with microinverters. i inherited some enecsys microinverters that apparently do not use grid frequency to ‘turn on’ but grid impedance . Would they work with a hybrid inverter in a totally off grid scenario or does hybrid inverters only present a frequency to any microinverter. i also inherited a grid tie mppt controller for battery charging. does the answer to Q1 apply to this unit also? Hi Solar Quotes, here are my 2 bob’s worth. All inverters sold in Australia have a safety feature, they cannot export power to the grid when the grid is down. You can use your PV system when the grid is down, but must you must have it isolated from the grid. This applies to both micro as well as string inverters. Your inverters do not know where the power comes from, whether it is grid or your own home made grid via batteries, or a generator. For micros, it is easy as there are many 24 – 48 volt dc / 230 vac inverters on the market and they will run from any small battery bank. At my block I use 4 off 12 volt batteries, 2 in series and parallel the two, thus 24 nominal for my inverter. No grid connection. For string inverters: you can use the same method, but most of these will require a minimum input voltage of say 130 volt dc,,, thus you will need a few more batteries in series, perhaps 12 of them, and remember “Main Switch Off”, perhaps connect via a generator switch which has only two positions. In short: your inverter don’t care where the power comes from as long as it meets the specification. On one sunny day recently, my PV system, 6 kW Enphase produced 43 kWh, two days later raining all day and barely made 2 kWh. Go Solar, it will pay for itself, but don’t quit the grid as long as your system is sized to not selling to the grid, but when in need, buy from the grid. Hi Finn, Thanks for sharing your knowledge about solar power systems. Can’t say I understand fully yet, but it has answered many questions. Like your style and SCIRO did you no harm and engineers can be fun! I like your ‘block diagrams too! (a compliment from a chemist/researcher/retired public servant). It was good to hear from CSIROs new boss that they were still meant to serve the people, not just the Government of the day. Currently, I have 4.2 kw system averaging 12.4 kwh/day ( and an oversized evacuated tube HWS that runs without need for mains heating. I only use about a third of the kwhs generated, so I get $0.711/kwh for feed in from the excess. Batteries make no sense now. What is the extra cost of battery ready inverter?